Now, I should really do some study. It’s not that I haven’t done any yet, but it’s amazing how much more appealing household chores become when study is the alternative. Time to hit some past case studies. My final Commercial Actuarial Practice exam is tomorrow. Would appreciate some prayer if you are so inclined. A large chunk of the work I do is helping government make policies for health, usually disability, services. I was sent this story this morning. The trailblazing Sydney actuary is my boss and this is the scheme he designed. I get excited about doing this sort of work because I can see how beneficial it is going to be – for everyone. Go check it out. You can even have your say – if you are so inclined. I think this big exam tomorrow is going to be tough. I think 8 hours of report writing is heinous. I think I would appreciate your prayers! It was amateur hour at the three beans roasting session this week. No disasters with the coffee – that all come out spectacular as usual – but we weren’t the well-oiled machine we have been in the past. It was a bit early to crack it open (only 3 days post-roast), but I couldn’t resist starting on the Brazil Daterra today. Macchiato + Choc-Chip Hot cross bun. Yum!! As an aside, how much better is a choc-chip HXB than a regular HXB?!? This year, Bakers Delight have experimented with a Mocha flavoured HXB. Probably even more yucky than the ones Coles makes with citrus peel. Goo! See you all next Saturday. Until then, please feel free to keep my blog ticking over by suggesting new flavours of HXB for Bakers Delight. 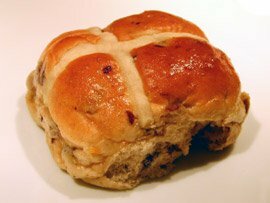 Hot Cross Buns on wiki. CAP Course.